Skulduggery in Elftown – A Free Christmas Story! It’s almost Christmas so here’s a story for all the good boys and girls. If you head off to the North Pole and take a sharp left by the frozen fir trees, you can find a small iced-over track. Head on down this for a mile or two, and if you sprinkle some magic pixie dust, you might just come across Elftown. It’s a busy place all year round, but especially at Christmas time. You see, all the elves are helping Santa get his sleigh ready for the big day. 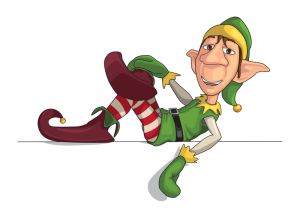 It’s no easy task, even for experienced elves, and Pickles, the chief elf, has a very important role to play. He has to make sure that all the elves turn up for work each morning and that the assembly line never breaks down. He also has to ensure that the rubbish dump is always full.